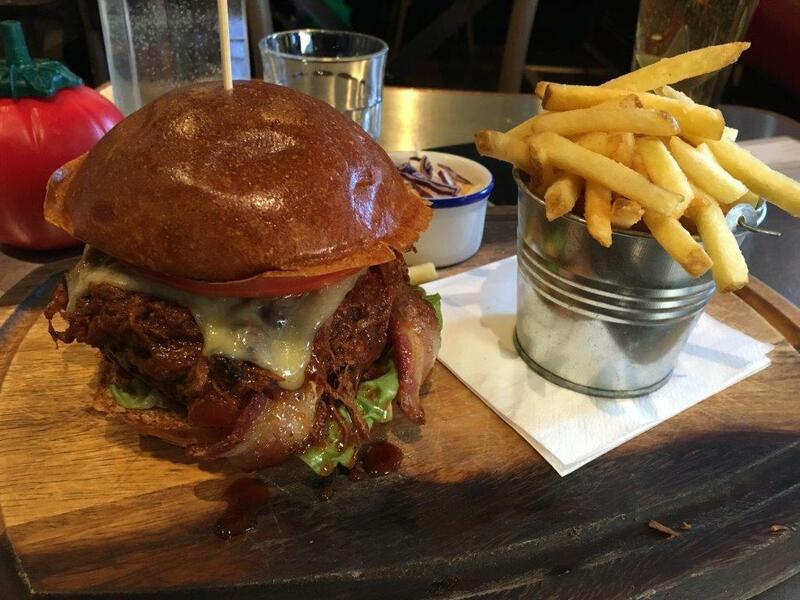 6oz patty loaded with Cajun seasoning, pulled pork, chilli beef, crispy bacon, Cheddar cheese, lettuce, beef tomato, served with skin-on fries. The concept of going to a celebrity restaurant is one that fills me with a certain amount of dread as my assumption would be one of style over substance: that a celebrity owner and the presence of untold amounts of memorabilia would draw in fans of that celebrity rather than appreciative gourmands. My next assumption would be that the food could afford to be mediocre in quality and that the cooking might not necessarily be the greatest. While assumptions are notoriously unreliable, I’m quietly convinced (having been to several such establishments in the USA) that mine in this case are overwhelmingly valid. 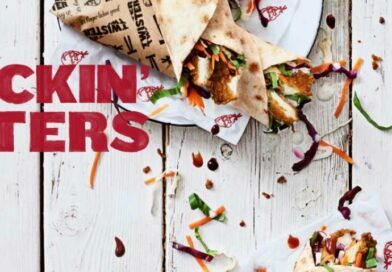 Rules are there to have exceptions and I’m delighted to confirm that Sticky Fingers is one such outlier. Now: let’s clear a few things up. I have never particularly enjoyed the Rolling Stones, I own none of their music and I have never deliberately listened to them. For the sake of balance, I also dislike The Beatles. I acknowledge that the Stones were a pivotal and influential act in the development of popular music and people whose opinions I value are quick to tell me that they are immensely talented and accomplished musicians. Simply put, I wasn’t here to lap up the atmosphere and admire the décor, I was here because I was starving and I happened to bump into this place while running work errands in Kensington. 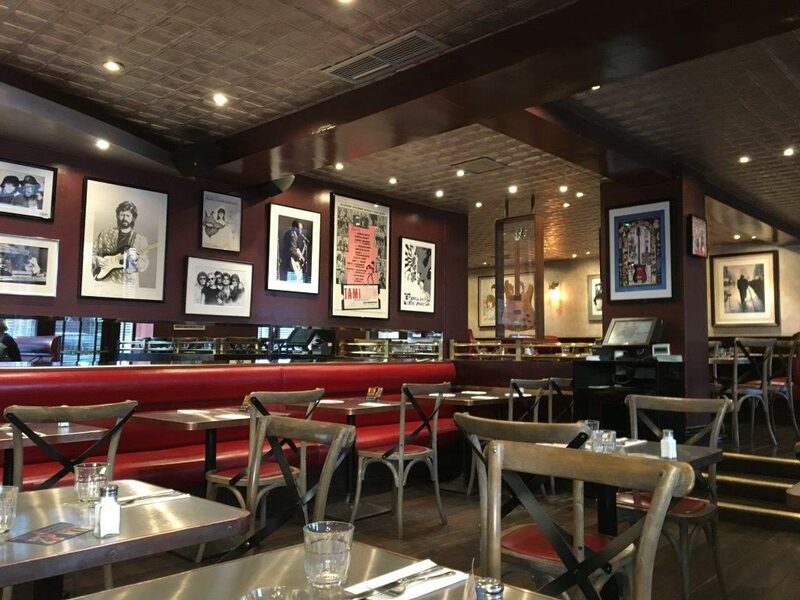 I’d heard about and read about Bill Wyman’s restaurant for a great many years, but to be honest I had no real ideas where it was or what it did. I clocked the neon signage from the corner of my eye and ambled over to have a quick look at the menu just out of curiosity more than anything else. What I read was a litany of some of my favourite dishes and sides on earth and the pricing looked relatively respectable. In I went, with, if I’m being brutally honest, expectations set to ‘moderate’. Unsurprisingly, the décor of the place was very much focused around a ton of (bass) guitars and posters for various Stones records and concerts. The music that played in the background was very agreeable and the service was prompt and super friendly. However, given that I don’t really like milkshake and I’d rather stick pins in my eyes than consume Sol, my attention turned to The Special burger that was detailed on a piece of paper that had been placed on my table. With a foursome of meaty delights, The Special was a compelling proposition, so I placed my order and settled back to await its arrival. And, boy, was I pleased when it turned up. The burger looked utterly beautiful. 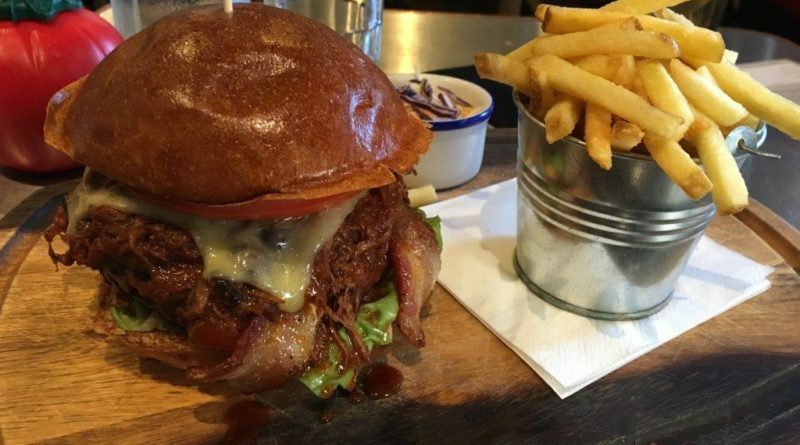 Molten cheese atop a meat volcano; the sharp Cheddar rolling down the pulled pork, itself straddling a couple of rashers of bacon, above the piquant beef chilli which in turn lay upon the sumptuous patty. 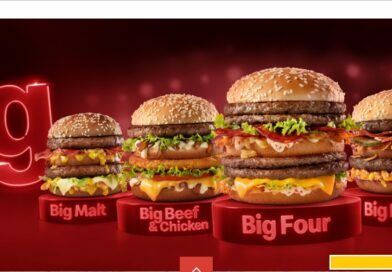 All of this was housed in a corking looking bun with a frankly unnecessary slice of lettuce peeking out at the base. The lettuce was doing little to prevent a steady stream of burger and pork juice escaping onto the serving board, a stream that turned into a cascading tsunami when I lifted this delightful creation for my first bite. As the torrent of liquid started to trouble my forearms, I had to nimbly shift strategy and adopt an incredibly rare deployment of cutlery to prevent clothing despoilment and being followed around by hungry dogs for the rest of the day. 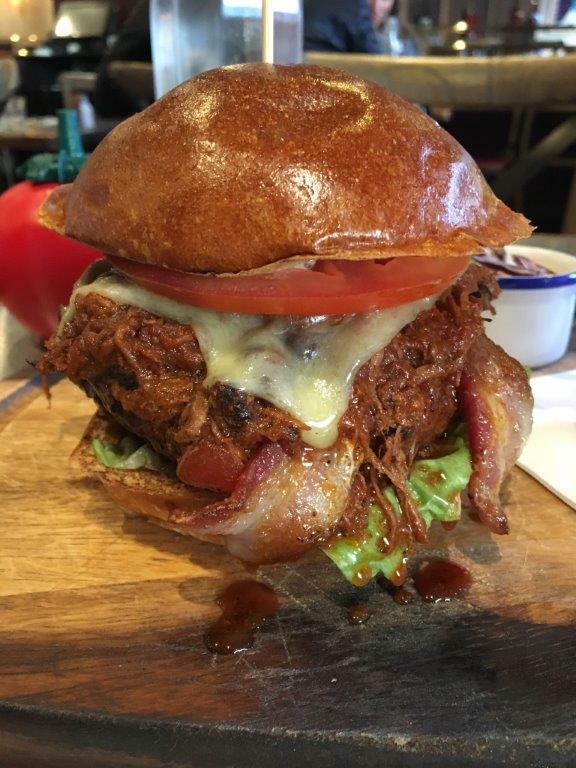 The flavours within the burger were sublime. 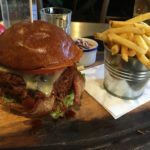 The chili had enough poke to cut through the other tastes, notably the BBQ sweetness of the pulled pork and the excellent flavour of the burger itself – which had been cooked to perfection. 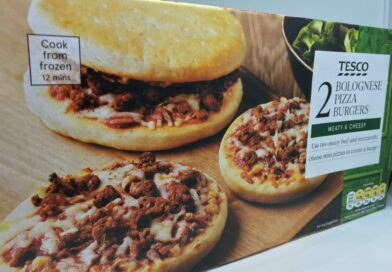 This was top quality product cooked extremely well, coming together to create a burger that just might well sneak into my all-time top 10. 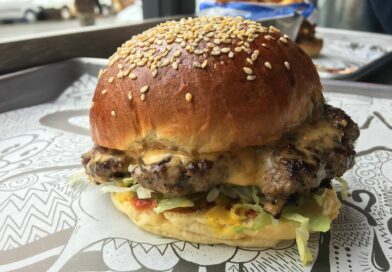 Given that the price of the burger included a portion of fries (which were satisfactory, if unremarkable) value for money was very good indeed, particularly considering the Central London location and in contrast to the pricing in, say, Five Guys. So, I guess I learned some valuable lessons from this experience at Sticky Fingers: don’t judge a book by its cover; don’t make assumptions about celebrity restaurants; and don’t wear expensive long-sleeved shirts when eating awesome burgers.